My boys and I had the opportunity to attend an intimate private performance by Daughtry to promote the release of their latest album, Baptized. We’d been invited to attend by a former neighbor. I call her my elevator friend. We met in the elevator of our building, where I was usually lugging a giant laundry basket down to the basement, looking like I just rolled out of bed, and she was usually dressed like a rock star and on her way to rub elbows with someone famous. Despite our differences, we would connect on those 30 second elevator rides with conversation about the one thing we did have in common, mothering two adolescent boys. She previously invited me to attend a few of these types of events, but I rarely followed through, always letting my anxiety get the best of me. For this one, however, I had an incentive beyond myself to make it happen. Since turning four, my youngest son has decided that he is going to be a rock star one day (in addition to a Teenage Mutant Ninja Turtle). Some days he is determined to wear blue jeans, a black leather jacket, chunky beaded necklace and baseball cap, his rock star uniform, and can’t quite understand why that wouldn’t go over so well in place of his regular preschool uniform. Add to the mix a new guitar from CVS that he would sleep with if I let him, and you’ve got a little boy who needs to meet a real live rock star. As my boys and I stood on the subway platform in the crush of rush hour waiting for the train that would whisk us down to the event venue, I felt the familiar constriction in my chest, the shortening of my breath, the panic settling in. I repeated a silent prayer, letting God know my strength had been expended and asking Him to take over from there and get my boys and me to our destination safely. Within moments, my oldest grabbed my hand. “Look Mom, there’s Jane from church! Let’s go talk to her.” And there she was, a familiar face to keep us company on our trip, a distraction from the fear that was threatening to take over. Thank you, God. As we walked into the event and made our way into the room where the performance was to be held, a small roped off area in the windowless basement level of the museum, I let God know I was going to be asking more of Him. The setting was potentially one of my worst nightmares (and that of my boys too). A roomful of strangers in close proximity, all angling and squeezing in tight to get the best view of the performance. My oldest immediately declared the event stupid and wanted to leave. I knew what he really meant was this is making me uncomfortable, I want to bolt. Oh kiddo, if you only knew how much I feel you. I felt the heat rising up my neck and into my cheeks, the compulsion to push through the crowd and back up the steps to air, to breath. As I worked to keep him and myself calm and continued my silent prayers for strength, I heard a familiar voice behind me, a mom from my son’s school. A mom who is growing an amazing business providing coping tools to children and adults who experience anxiety. A mom who knows a bit about and understands the anxiety that I am feeling. Thank you God, again. And then it was time. Time for my boys to see a real live rock star. I helped get them situated in the “kids pit” directly in front of the band and nervously left them alone. Dear God, please don’t let this be one of those moments where they can’t sit next to one another without beating on one another or starting a full on wrestling match. 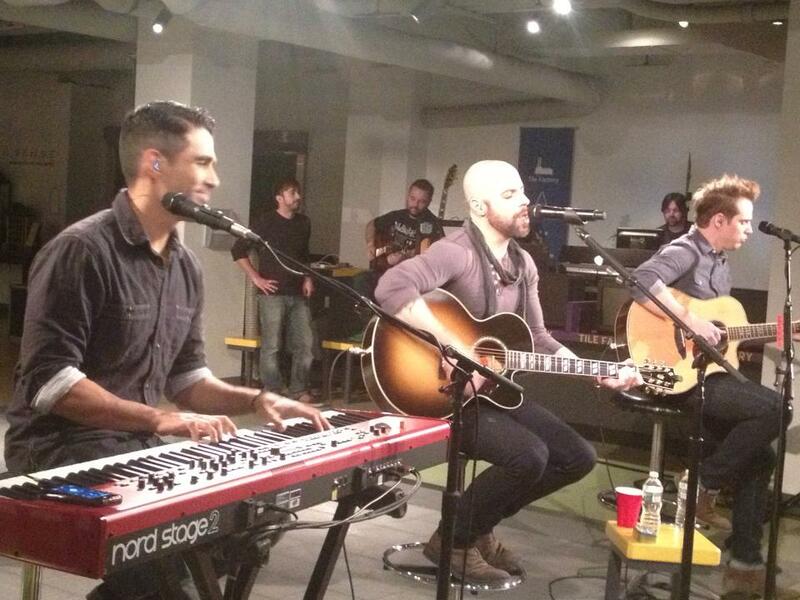 My worries evaporated the moment Chris Daughtry opened his mouth and started singing. I’ll be honest, I don’t watch American Idol. I’m not sure I had ever heard a Daughtry song prior to two days ago. I needed to Google him and listen to a few samples on iTunes before the event, just so I felt in the know. I was floored, and my boys were mesmerized. I’m thinking of inquiring if he’s available for babysitting. He was more effective than an iPad at getting the kiddos to sit still and attentive for a span beyond 30 seconds. His voice was powerful and balanced. It was soothing. For lack of more descriptive words, it was GOOD. With all the re-mixing and fixing up that gets done in studios these days, it’s hard to know what someone would sound like if he was just sitting on a stool with a microphone and guitar in hand. Chris Daughtry is the real deal, and he has three new fans in this household, not only for his singing talent, but for his humility and honesty when taking questions. He talked about where he started and the hard work involved in getting to where he is today, the many paths he had been on before finding the right path, his own path. He admitted to being a “D-bag” from time to time. He made it clear that rock stars are human. As his set drew to a close, we made our way to the meet and greet area where the boys would get their chance to say hello. While we were waiting, a member of Daughtry’s crew approached my youngest who was patiently waiting for his turn, cradling and quietly strumming on his CVS guitar, and slyly handed him a guitar pick signed by Chris. If I thought he was into the guitar before this, we are now in a whole different stratosphere. He’s now expecting the guitar lessons to begin immediately and our living room chair has turned into his make-do stage for impromptu performances. When we finally reached the front of the line to meet the band, both boys went into panic mode. The thought of actually going and talking to those rock stars was just a little too much for them to handle in that moment. It was a little too much for me as well, and I had been counting on the boys to take the lead. I hesitated, prepared to give up our turn, knowing there was no way I was getting those boys into the photo op without an ugly scene, and knowing that my heart was racing and my palms were getting sweaty already. As I got pushed through the door by his handlers, who were anxious to keep the line moving, all I knew was I had to keep my cool and show my boys there was nothing to be afraid of. I laughed, threw my arms up in the air, and declared, “well I guess since my kids just ditched me, I get you guys all to myself”. The band smiled and laughed along with me and then I got my photo op, with my boys peering in from the hallway. Not the photo op I had been hoping for, but one to remember. Walking down the sidewalk back to the subway that would take us home, my oldest son grabbed my hand, turned to me and said, “That was really cool Mom. Thanks for taking us.” And in that moment, I felt like a rock star.